Paolo is a partner with Langevin Morris Smith. 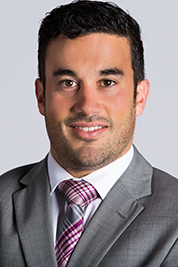 He graduated from the University of Ottawa in 2006 and immediately commenced his articles at Langevin Morris Smith. He then joined the firm as an associate lawyer in 2007. During that time Paolo has developed a busy law practice and he prides himself on fostering trust with his clients in handling their everyday legal issues. Paolo’s practice consists of a variety of legal disciplines, including criminal defence litigation, residential real estate transactions, civil litigation and administrative law. He has appeared before the Ontario Court of Justice, Ontario Superior Court of Justice and the Court of Appeal for Ontario, along with numerous boards and tribunals. Paolo is a member of the Canadian Bar Association, the Defence Counsel Association of Ottawa and the Carleton County Law Association. He is actively involved in the legal community. Paolo is currently serving as the secretary for the Defence Counsel Association of Ottawa. He has attended as a speaker at a number of legal conferences and seminars. Paolo is also an instructor with the Department of Laws at Carleton University where he has taught law since 2009. When not in the courtroom or classroom, Paolo can be found outdoors enjoying a round of golf or running around on a soccer field. Paolo can be reached at (613) 230-5787 ext. 306 or pgiancaterino@lmslawyers.com.